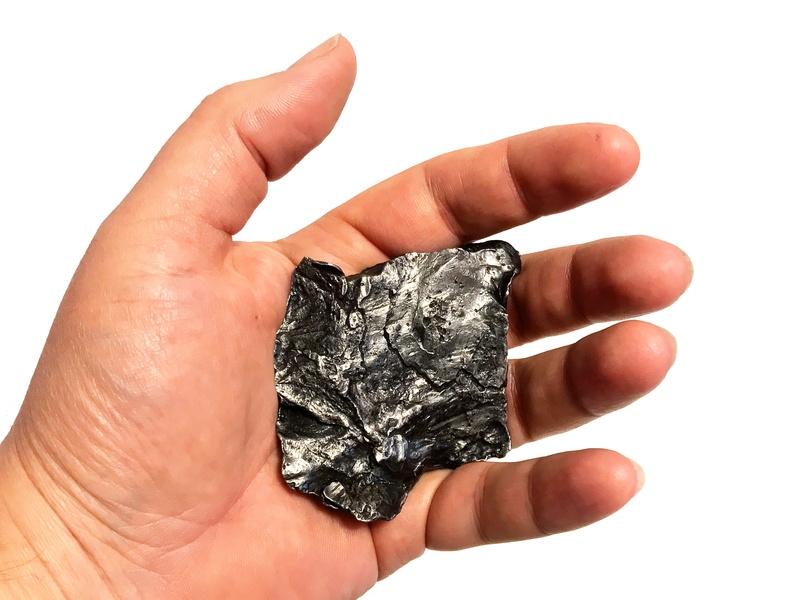 This is one of my favorite things: a piece of shrapnel from the Sikhote-Alin meteor that exploded over Russia on February 12, 1947. I picked it up at RTMC a couple of years ago. 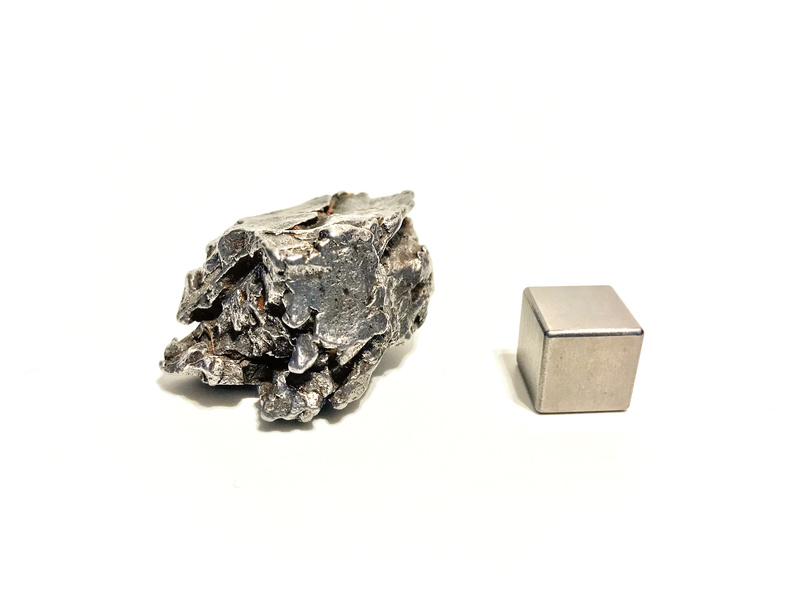 I love it because it looks exactly like what it is: a wrecked piece of iron, fractured with the rest of its parent body from the core of long-destroyed planetoid, blasted asunder in the atmosphere in a multi-kiloton airburst, and finally shattered against the bedrock of the Sikhote-Alin mountains in far eastern Siberia. Every surface bears witness to the awesome energies of its birth, unleashed in a chain of events that we can barely comprehend, and certainly could not survive. It fits perfectly in the hand, inviting you to run your thumb over its cracks, pits, and twisted, jagged edges. It has a satisfying heft, befitting a solid chunk of metal. 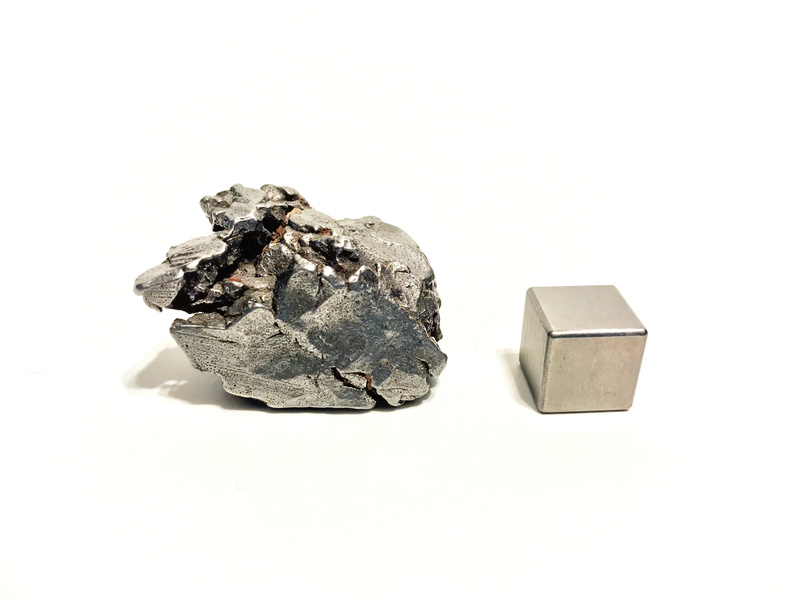 It is 93% iron and 6% nickel, with small amounts of cobalt, phosphorus, and sulfur, and bare hints of germanium, gallium, and iridium. At room temperature it feels cold to the touch, as if it somehow still holds the chill of space. I like to pass it around and have people handle it. With its weight, seemingly unnatural coolth, and textures that so clearly tell the story of its creation, it’s a fantastic hand specimen. I like to hold it myself, and think about the billions of years it spent in space. It was floating around out there while our ancestors attained multicellularity, backbones, limbs, amniotic sacs, hair, bipedality, fire, agriculture, writing, telescopes, powered flight, and the ability to split the atom. And then our paths crossed, quite literally, when the trajectory of the Sikhote-Alin meteoroid intersected that of Earth. The energy released by the airburst of the Sikhote-Alin meteor is estimated at 10 kilotons (for comparison, the Chelyabinsk meteor in 2013 was about 500 kilotons). In all the long history of Earth, such large explosions had been the exclusive province of volcanoes and asteroid and comet strikes. But the Sikhote-Alin meteor entered a new world, where its 10-kiloton detonation was only the sixth largest explosion on Earth in the preceding 20 months, behind the atomic blasts at Trinity, Hiroshima, and Nagasaki in 1945, and the Able and Baker tests at Bikini Atoll in 1946 (all between 16 and 23 kilotons). Because it is only a matter of time until Earth is threatened with a civilization-ending or mass-extinction-level impact, is is also only a matter of time until we stop thinking of astronomy as the niche preoccupation of a few, and start realizing that it is an unavoidable aspect of our survival. We need reminders of that fact. This one is mine. The June 2018 Sky & Tel should be on newsstands any day now, and it has a feature article that is the culmination of a personal quest. 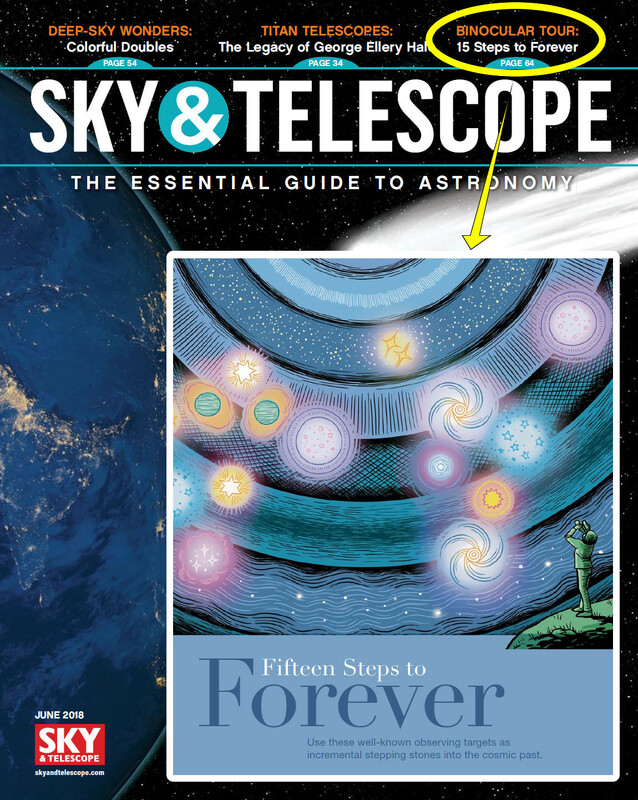 By far my favorite among my previous Sky & Tel articles is “Twelve Steps to Infinity” from the December 2016 issue. But as much as I love that article, it only covered the winter sky, so it was incomplete – I needed to do a matching article for the summer months. That’s the new article out this month, and it doesn’t just match “Twelve Steps”, it exceeds it. As I say in the new article, in it I “start out a little closer, end up much farther out, and see a more diverse set of targets”, from the closest star visible to Northern Hemisphere observers (other than the Sun), to a quasar more than two billion light years away. I owe a huge thanks to my editor, Diana Hannikainen, for making the data table and for numerous improvements to the text. Her name’s not on the article, but it probably should be, so many and so helpful were her suggestions. There’s a LOT of other interesting stuff in this issue. I’ve written here many times about my visits to the big historical telescopes on Mount Wilson and Palomar Mountain, all of which were built at the instigation of George Ellery Hale, whose legacy of monster scopes is explored in this issue. Also, there are not one but three articles on asteroids, the scars of past impacts, and the threat of future ones, which is timely given my recent talk on the subject. I hope you enjoy my new article. As always, suggestions for improvements are welcome, and the comment field is open. My recent talk on impacts and the end-Cretaceous extinctions reminded me that I’ve never posted about my meteorite collection. It’s not a large collection, just a handful of things I’ve picked up, but each is satisfying in its own way. 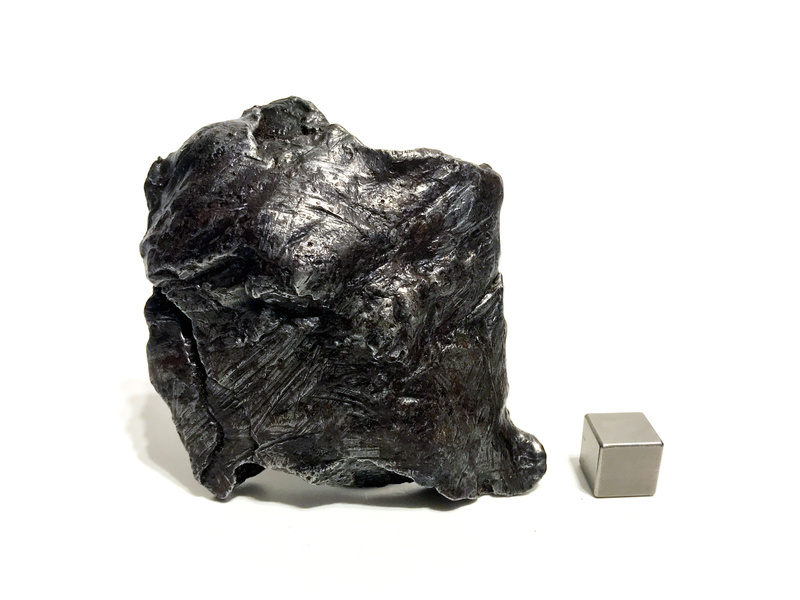 This is the first meteorite I ever owned, a 40g piece of Campo del Cielo from Argentina. It’s about the size of the last joint of your index finger. Following the universal standard for meteorite photography, the scale cube in the photos is 1cm. I picked this up probably 15 years ago at an auction at a Society of Vertebrate Paleontology annual meeting. I don’t remember the year – early 2000s for sure. The meteorite came with a little drawstring bag made of red felt, and a certificate of authenticity. It was clearly marked as a chunk of Campo del Cielo, which fell over northwest Argentina four or five thousand years ago. The original Campo del Cielo meteor exploded in the atmosphere, much like the Chelyabinsk meteor over Russia in 2013, but on a much grander scale. The Chelyabinsk meteor is estimated to have been 20m in diameter, and it produced an airburst of approximately 500 kilotons. The Campo del Cielo meteor was probably more like 50m in diameter, so it would have been a multi-megaton explosion in the upper atmosphere. The resulting strewn field is 2 miles wide, more than 11 miles long, and includes at least 26 craters with diameters of up to 100 meters; the impact of the fragment that produced the 100-meter crater would itself have been multi-kiloton event. I didn’t know any of that at the time I got the meteorite at the auction. I vividly remember how much I paid for it: $80. I remember so clearly because I almost instantly regretted it. I don’t know who I was talking to afterward, but someone looked at the meteorite and commented that it would be easy to fake with a bit of iron slag. That seemed plausible – it didn’t look like any meteorite I’d seen pictures of, so I assumed the chance that it was a fake was high. I had other fish to fry at the time, being a new dad and halfway through a dissertation, so I never did any research to see if the meteorite was real or fake. I kept it, but I never put it on display, and over the years I sort of lost track of it. I rediscovered it this January during a major bout of house-cleaning. 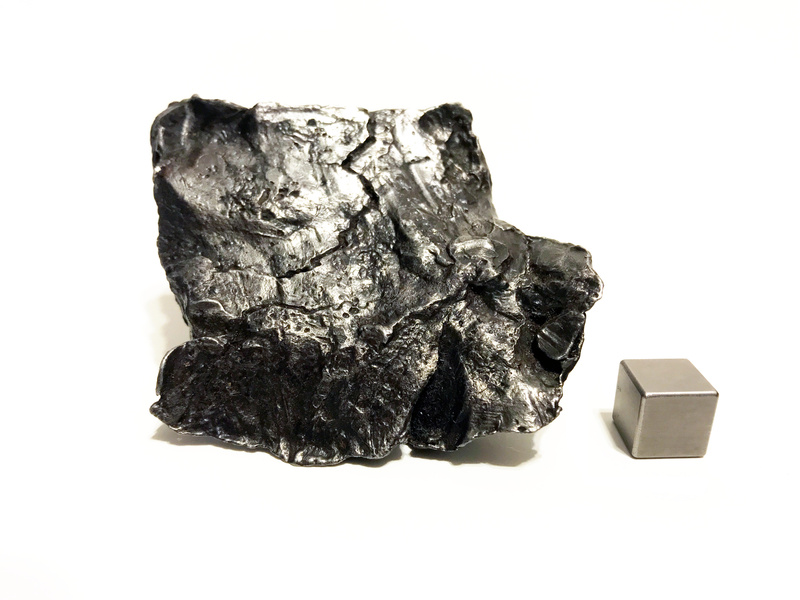 It’s funny, in the time between when I obtained this piece and now, I’ve looked at so many meteorite photos that I can just glance at this and think, “Yep, it’s a Campo”. Five minutes of image searching for Campo del Cielo pieces will turn up many authenticated examples with the same general appearance, like angular chewed gum with fracture lines and surface pitting. 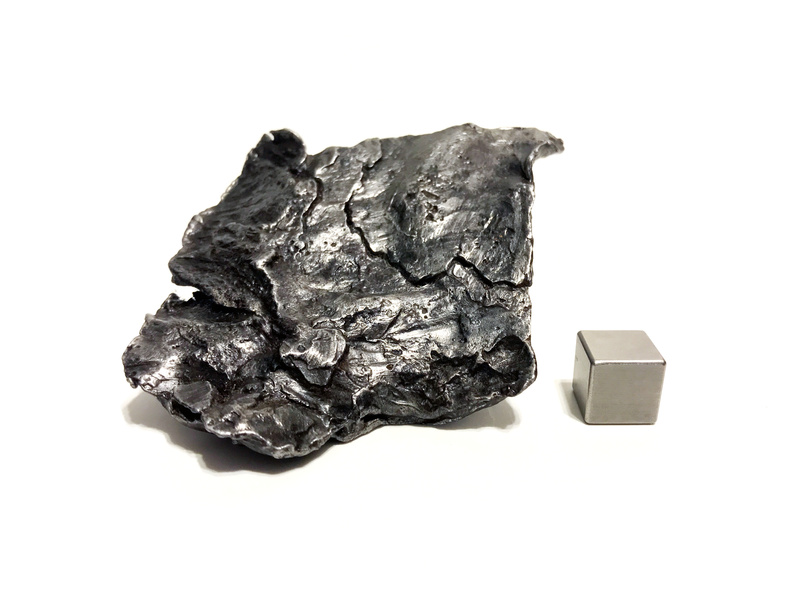 Campo del Cielo is one of the least expensive meteorites to obtain, with prices around $1/gram still being pretty common. (So in fact I overpaid a bit back when I got this, but since it was an auction to support the society I don’t mind.) With such distinctive morphology and such low prices, it’s probably much less expensive to simply buy a real piece of Campo than to fake one, especially at small sizes. So even though it is one of the smallest pieces in my collection, this little gem means a lot to me. It tells two stories: one about my personal journey from interested-but-ignorant space enthusiast to semi-knowledgeable, semi-professional astronomy writer – and one about a 65,000-ton chunk of iron from the core of a shattered planetoid, which exploded with the force of an entire nuclear arsenal and showered a vast area with what must have been a lethal rain of shrapnel, from pea-sized up to house-sized. Including this little piece, cosmic voyager and witness to awesome forces of creation and destruction. If you’re interested in obtaining a meteorite or starting a collection, I have two pieces of advice. The first is, buy from reputable dealers. Many honest dealers are members of the International Meteorite Collections Association and will list their IMCA member number wherever they do business. There are good dealers who are not IMCA members for various reasons – some just don’t like clubs and the politics that sometimes comes along with membership – but it’s a start. Also check seller feedback if you buy from online markets like eBay. And use search tools to do quick checks on individual dealers; the meteorite collecting community is pretty vigilant about detecting and outing bad actors. The second and probably more important guideline is to educate yourself. Spend a week of evenings looking through websites and online ads and learning to know what to look for in genuine meteors. 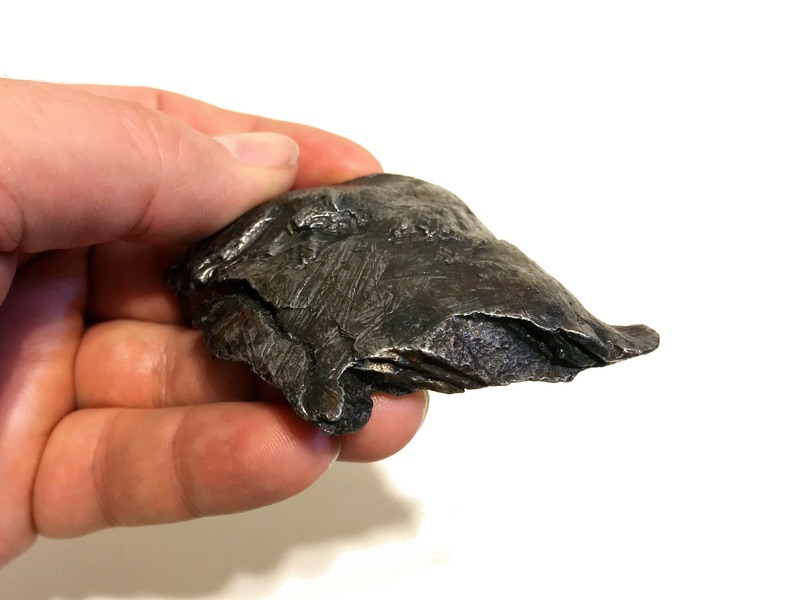 It’s not completely foolproof – a few unscrupulous people will pick up bits of inexpensive recent falls and try to pass them off as examples of rare and valuable historical meteorites, for example – but at least you’ll develop the knowledge to tell genuine meteorites from “meteorwrongs”. Good hunting! 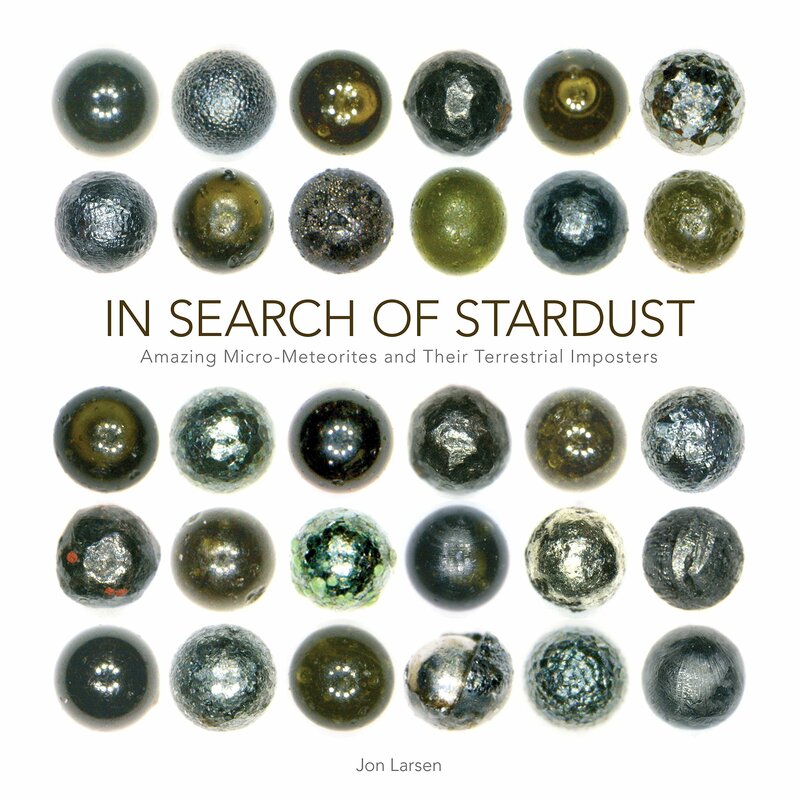 I don’t know how or why this is happening, but Jon Larsen’s excellent book In Search of Stardust: Amazing Micrometeorites and Their Terrestrial Imposters, which originally retailed for $24.99, is currently available on Amazon for $2.37. If you have Amazon Prime, the shipping is free, so this really nice full-color hardback book is cheaper than…well, just about everything. I’ve had a copy since it first came out and I just ordered another one on general principles. Thinking about ordering a stack to pass out to people who are interested in space, science, or just, like, things. I don’t know how long this ridiculous sale will last, but I suggest you do the right thing. Here’s the link. Last night I got to scratch some long-standing itches. 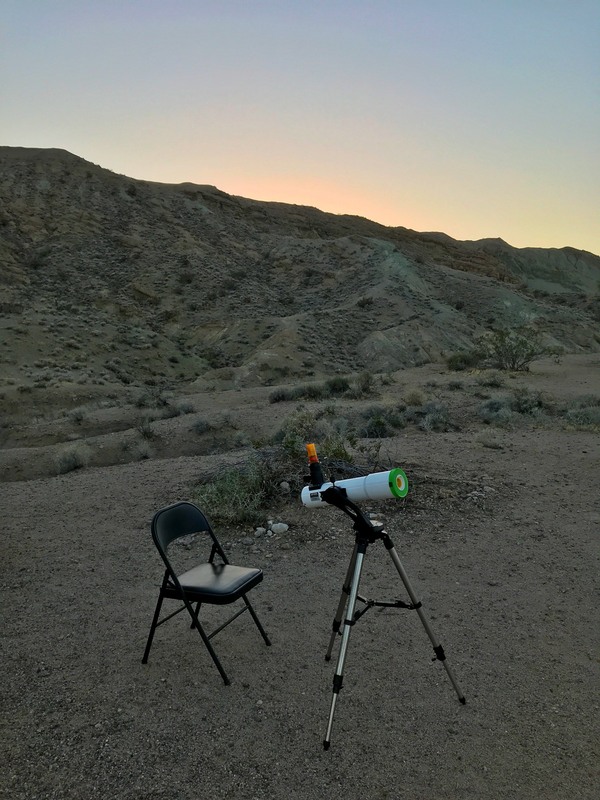 I hadn’t been out for an all-nighter in a long time, hadn’t had a long solo observing session in over a year, and hadn’t been to Owl Canyon since October, 2015. It wasn’t supposed to be a solo session. London and I had not been camping since our February trip up the coast to see elephant seals with Brian Engh, so we’d been looking forward to getting out into the desert together. But just before we were supposed to leave, London’s allergies started acting up. We basically didn’t get a winter – March was the only month since last spring that temperatures didn’t hit 90F here, and it did get up to the high 80s, so pollen loads have been way high this season. Air quality was predicted to be even worse at Barstow than it was at home, so London decided to stay home and keep Vicki company. I got out to the campground at 7:00 straight up, had camp set up by 7:20, and then had time to sit and watch the stars come out. I saw Venus first, at 7:37, then Sirius, Procyon, and Castor and Pollux in short order. There are brighter stars farther west, namely Capella, but it was down in the fading sunset glow. I took a break to have a snack, and by the time I was back, Orion and the Pleiades and Hyades were out. Unfortunately, so were a few bugs. I used to use a Thermacell insect repellent, and it works well in still conditions. But in my experience, if there’s even a hint of a breeze, the protective bubble put up by the Thermacell tends to fall apart. Plus it requires some tending, and reloads aren’t free. 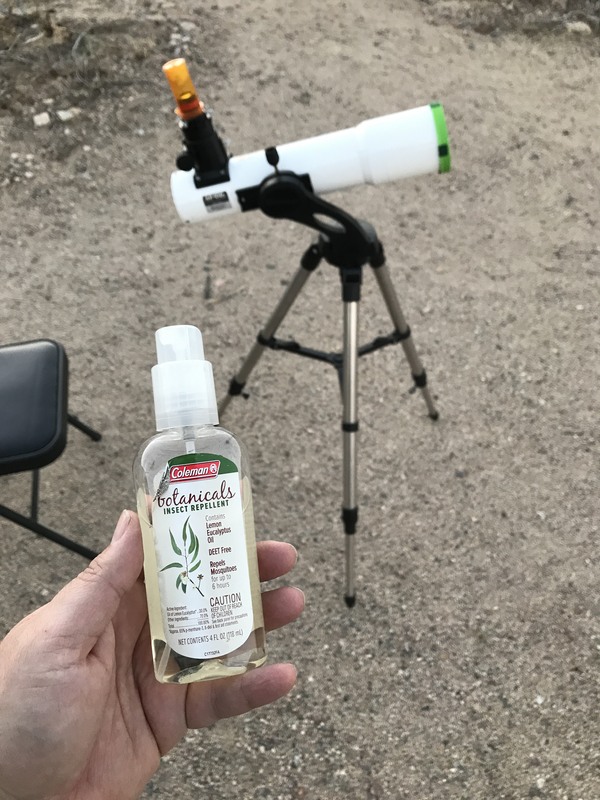 About three years ago I discovered this no-DEET eucalyptus-based repellent and I use it every time I go out. It will wear off after a few hours, but it’s easy to reapply. I do squirts on my wrists, back and front of the neck, and ears, and if the bugs are really nasty, on my forehead and the backs of my hands. This stuff works, and I’ve been using it long enough that the smell of it conjures expectations of wild places and dark skies. I’ve started writing out some goals at the start of each long observing session. Given the number of things I do – teach, serve on committees, mentor current students and interview incoming ones, do research, write, publish, travel, play games, spend time with family and friends – you might think I’d be an organized observer. The truth is that even at my best I am almost hilariously disorganized when it comes to observing projects, or even keeping up interest and momentum in a given thing over the course of an evening. I suppose that’s why I like the Astronomical League’s observing programs so much, and why I dig Messier Marathons: both activities give me some much-needed direction. Enjoy the night sky! As I said above, it had been a long time since I’d had a nice long, unhurried session in which to unwind. Observing is my sanity break. Check on a few old Binocular Highlight targets. I try to get out and re-observe each thing before I write it up for Sky & Tel, but sometimes life intervenes and I have to roll using my old observing notes. That’s not ideal and it gives me hives. I really like to go back and check on published targets and make sure I haven’t pushed any duds. Find new Binocular Highlight targets. The beast gets hungry once a month and it has to be fed. And in truth it’s a joy – finding things to write about pushes me into parts of the sky I haven’t explored, and I regularly discover wonderful things that broaden my experience and enjoyment of the night sky. Mini Messier Marathon. I didn’t get to do a full Marathon this year – I was traveling on the most promising weekend. So I thought I’d scratch that itch by doing a partial Messier run. It’s a good way to hone skills, put equipment through its paces, and re-learn the positions of a few of the more obscure objects. Binocular double stars. I have been working on this AL observing program since 2013! The trouble is that I tend to forget about it for months at a time. Last year I passed 40 objects on my way to the required 50, so I knew I was within striking distance. I was rolling with what has become my default setup: the Bresser AR102s and the 7×50 binos that came with it. For eyepieces I used the Edmund 28mm RKE, switching to the 8.8mm ES82 for a few difficult targets. I also had along my trusty Celestron Skymaster 15×70 binos, which came in handy on a few things. 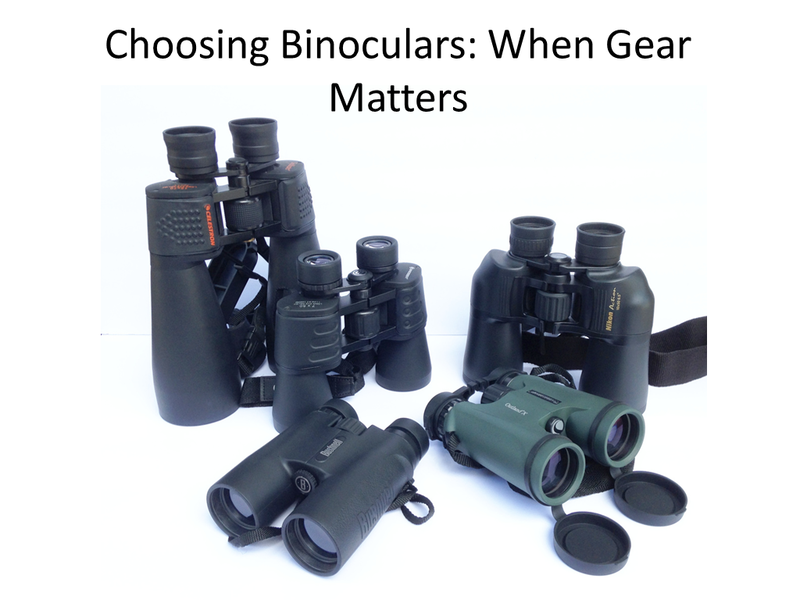 Pretty simple: one scope, two eyepieces, and two binos. It was enough. I started with a run through the Messiers and bright NGCs in Cassiopeia, Perseus, Auriga, Taurus, Gemini, Orion, Canis Major, and Puppis. These are mostly areas I’ve covered in Sky & Tel articles now, so I can run and gun mostly from memory. I did slow down a bit to check out some of the Trumpler and Collinder clusters, and I popped in the higher-magnification eyepiece to spend some quality time with the Messier clusters in Auriga and Gemini. I also spent some time chasing artificial satellites. I caught one going almost due west – it passed between the open clusters M46 and M47 while I was comparing them. I chased it for a full four minutes, from Puppis to Monoceros, Orion, Gemini, and Taurus to Auriga, where it flew through through the larger of the two “waves” of stars in the middle of the pentagon and then faded out at the western edge. I can’t really explain that – going west, the satellite should have gotten brighter, not dimmer. It was getting pretty low in the sky at it’s possible I lost it from atmospheric extinction rather it going into shadow, which seems geometrically impossible. I tracked another heading north-northeast in a polar orbit and tracked it for three minutes. At that angle, it crossed into Earth’s shadow very gradually. From the time I first noticed it dimming, it took almost a full minute to disappear. I caught a few shooting stars over the course of the evening. One zipped through my eyepiece field, but the other three that I saw were all naked-eye visible. The last once, well after midnight, left a brief glowing trail in the sky. By 10:45 I had logged 30+ DSOs and I was getting restless. I had no enthusiasm for the springtime galaxies. 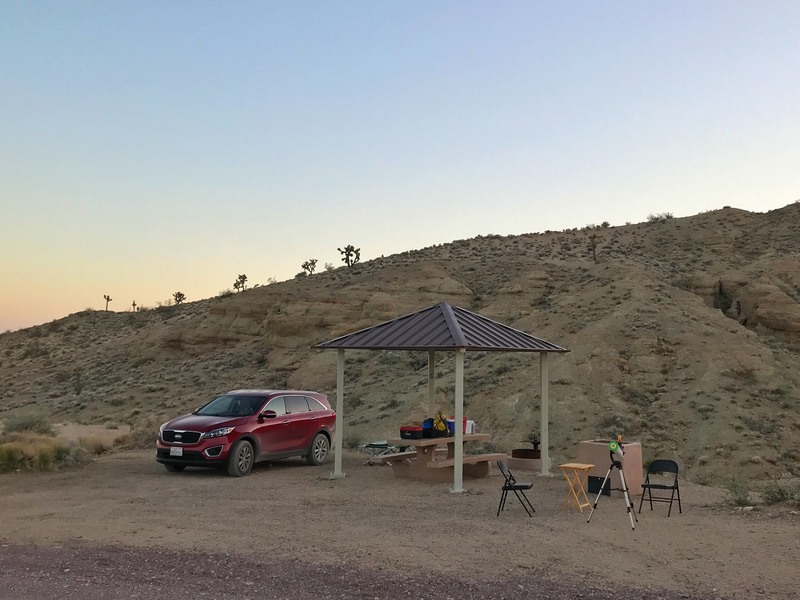 Instead, I hauled out my Bino Double Star logbook, which has been out with me on most observing sessions since the fall of 2013, although I’d only used it on seven previous nights and almost always from the driveway at home. I switched over to bino doubles and they drove my observing for the rest of the night. I did look at plenty of other things while tracking down the doubles, including a couple of new asterisms and some potential fodder for the Bino Highlight column. I usually have a rule about not logging new double stars from dark sites. Doubles are one of the few classes of celestial objects that usually look just as good from town, so if log them from dark sites I’m theoretically wasting my dark-sky time and simultaneously depriving myself of driveway observing targets. But heck, I was getting close to closing out the project requirements and I needed a change of pace. I also wanted to get another win on the board. I’d completed nine AL observing programs before, but most of them were in 2009 and 2010, and I hadn’t completed a new program since finishing the Urban Observing program back in 2013. Hard to believe that after knocking out nine clubs in my first five years as an AL member, I didn’t finish any more in the next five. It was an interesting early-morning run. Scattered clouds started moving in about 1:00 AM, and by 2:45 I was playing tag with sucker holes. Fortunately the clouds were moving fast across Cygnus, Delphinus, Equuleus, and Pegasus, and I managed to get four objects in the half hour between 3:40 and 4:10. That brought my total to 52, a couple more than are required. BUT! I’d forgotten about the requirement to observe at least five of the doubles on the list with naked eyes, and compare to the binocular view. So I’m not quite done after all. After getting those last four bino double stars, I thought I was finished for the evening. I’d had a great, cathartic run, logged dozens and dozens of DSOs, including a handful of new objects, and finished the instrumental observations for my tenth Astro League observing project. Then I saw that Jupiter was in the open. The scope was still set up, and I hadn’t paid my respects to the king of planets, so I had a look and made a quick and dirty sketch in my notebook. Even that was not my final object of the evening. After I’d finished with Jupiter, Cygnus was in the clear, so I went to possibly my favorite target for binoculars and rich-field scopes: the heart asterism around Sadr, at the heart of the Swan. I stared until I felt myself starting to nod off, and checked the time. It was 4:37 AM, precisely nine hours since I’d picked Venus out of the sunset. That felt like fate, so I called it. I observed a total of 60 deep sky objects, 43 of which were Messiers, and an even 90 objects of all types. Not bad for what felt like a very relaxed – and relaxing – run. 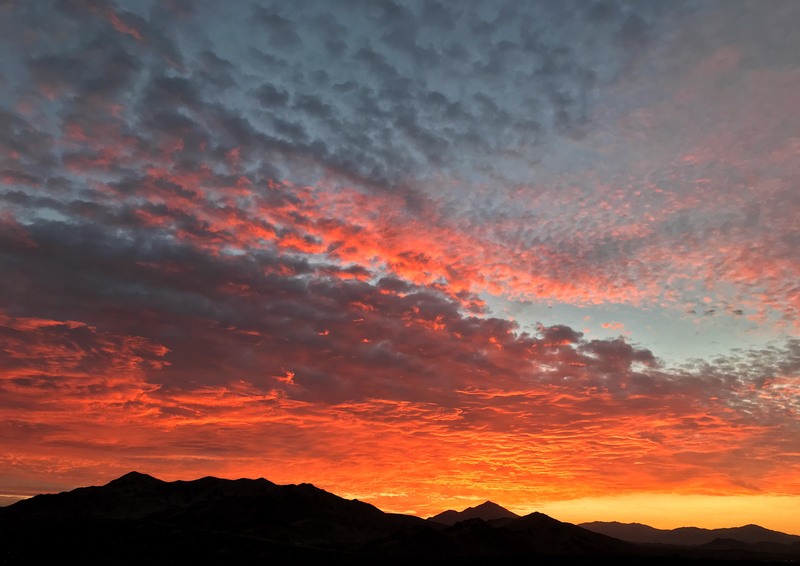 It’s cloudy over SoCal tonight, and that’s a good thing. I need to go rest on my laurels. Catch you in the future. Already posted this on SV-POW!, but I reckon there might be a few folks who check this blog but not the other. UPDATE: here’s the video of the talk. You are currently browsing the 10 Minute Astronomy blog archives for April, 2018.